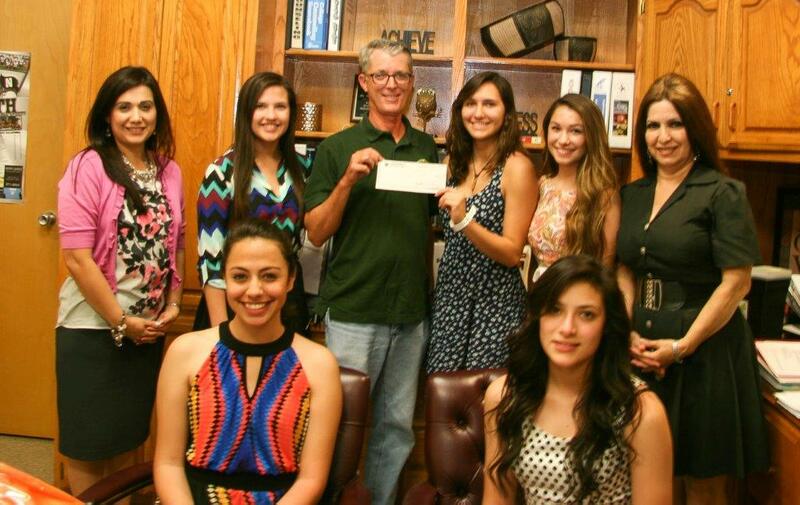 On May 21, 2014, the Junior Class of PSJA North High School presented a check for $1,400 to the Friends of the Wildlife Corridor in support of programs at the Santa Ana and Lower Rio Grande Valley National Wildlife Refuges. The officers of the Class of 2015, under the sponsorship of their Science teacher, Marie Santiago, and their principal, Linda Carrillo, led their classmates in a fund-raising effort to support the 2014 Junior/Senior Prom, with the intent that funds raised to exceed Prom costs would be donated to Refuge projects. This is the third year that the PSJA North High School Junior Class has donated funds to the Friends of the Wildlife Corridor. PSJA North Junior Class Officers include Andie Garza, Jaydee Garza, Ariana Garza, Lindsey Adams, and Bianca Montez. The Friends of the Wildlife Corridor is a non-profit group supporting the Santa Ana and Lower Rio Grande Valley National Wildlife Refuges since 1997, and Richard Ramke accepted the check for the Friends. Laura de la Garza also attended the presentation on behalf of the US Fish and Wildlife Service.